Washington, D.C. - The U.S. Botanic Garden (USBG) presents a new exhibit Celebrating New American Gardens from January 31 through October 15, 2019. The exhibit showcases 21 gardens from across the United States that have created new gardens or renovated a garden within the last five years. Photos, drawings, landscape designs, and project descriptions share the story of each new garden. Public gardens across America are engaging, inviting, and dynamic. Gardens are living creations, as they display seasonal changes along with a constant ebb and flow. These new gardens showcase new plant collections, create spaces for people to connect with nature, and foster sustainability. "Gardens are always changing - with the seasons, with emerging gardening trends, and with their communities. 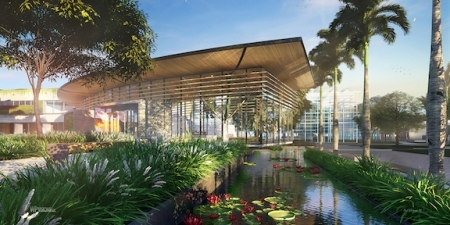 We are excited to feature these new gardens and showcase the diversity and beauty of modern garden projects," said Saharah Moon Chapotin, U.S. Botanic Garden executive director. Throughout the exhibit run, the USBG will offer programs, workshops, lectures, and tours related to the exhibit. Visit www.USBG.gov/NewAmericanGardens to learn more about the exhibit and associated programs.